This is probably the most well-known of these, since Isaac Asimov [for those poor souls who have never gazed upon Asimov's awe-inspiring sideburns, that's him pictured up top] is famous for (among many other things) his three laws of robotics. Even so, I include it because it is one of the only actual sciences to have been first named in a science fiction story ("Liar! ", 1941). 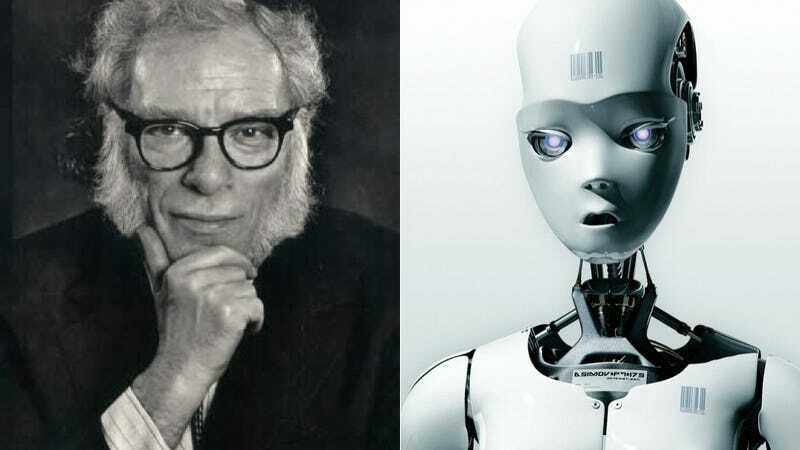 Asimov also named the related occupation (roboticist) and the adjective robotic. The other science that received its name from a science fiction story, in this case Jack Williamson's novel Dragon's Island, which was coincidentally published in the same year as "Liar!" The occupation of genetic engineer took a few more years to be named, this time by Poul Anderson. A defining feature of life in outer space (sans artificial gravity, of course). The first known use of "zero-gravity" is from Jack Binder (better known for his work as an artist) in 1938, and actually refers to the gravityless state of the center of the Earth's core. Arthur C. Clarke gave us "zero-g" in his 1952 novel Islands in the Sky. One of the other defining features of outer space is its essential emptiness. In science fiction, this phrase most commonly refers to a region of empty space between stars or that is remote from the home world. E. E. "Doc" Smith seems to have coined this phrase in 1934. The more common use in the sciences refers to the region of space outside of the Earth's atmosphere. An ion drive is a type of spaceship engine that creates propulsion by emitting charged particles in the direction opposite of the one you want to travel. The earliest citation in Brave New Words is again from Jack Williamson ("The Equalizer", 1947). A number of spacecraft have used this technology, beginning in the 1970s. A suit that maintains a stable pressure around its occupant; useful in both space exploration and high-altitude flights. This is another one from the fertile mind of E. E. Smith. Curiously, his pressure suits were furred, an innovation not, alas, replicated by NASA. Computer virus, that is. Dave Gerrold (of "The Trouble With Tribbles" fame) was apparently the first to make the verbal analogy between biological viruses and self-replicating computer programs, in his 1972 story "When Harlie Was One." Another type of self-replicating computer program. So named by John Brunner in his 1975 novel Shockwave Rider. A large planet, like Jupiter or Neptune, that is composed largely of gaseous material. The first known use of this term is from a story ("Solar Plexus") by James Blish; the odd thing about it is that it was first used in a reprint of the story, eleven years after the story was first published. Whether this is because Blish conceived of the term in the intervening years or read it somewhere else, or whether it was in the original manuscript and got edited out is impossible to say at this point.